The 3M Post-it(R) Flag Pen, one of this year's hottest promotional products, is now available in a classic new color, exclusively from 4imprint. 4imprint, a leading on-line and catalog imprinted products retailer, teamed up with 3M Corporation to introduce the Post-it(R) Flag Pen in blue. The Post-it(R) Flag Pen is available in black, silver, white and blue. The Post-it(R) Flag Pen comes with 50 blank Post-it(R) Flags. The Post-it(R) Flag Pen with Sign Here Flags, available in black, white and silver, comes with 50 'Sign Here' Post-it(R) Flags. Post-it(R) Flag refills are available with each order or at office supply stores. The Post-it(R) Flag Pen is just one in a full line of Post-it(R) products that can be imprinted with a company name or logo. "These pens are popular with so many audiences. That is what makes them the ideal giveaway," said Suzanne Worwood, 4imprint Vice President Merchandising. "Accountants, book club members, doctors, financial planners, small business owners, students and teachers all use the Post-it(R) Flag Pen because it's so easy to mark, tab and pinpoint." 4imprint also offers the new Post-it(R) Flag Pen and Highlighter Combo. This new product can be imprinted with a company name or logo and features a pen, highlighter and Post-it(R) Flags. Additionally, 4imprint offers the Post-it(R) Flag Highlighter and the Post-it(R) Flag Highlighter with Sign Here Flags. Each is available in translucent or opaque colors. "These are the kinds of pens that people don't want to lose," Worwood said. "They'll buy refills for the Post-it(R) Flags. Because it is so useful, this product keeps a company's name or logo in front of prospects and customers longer." Visit http://www.4imprint.com/post-it to view all Post-it(R) products available from 4imprint. 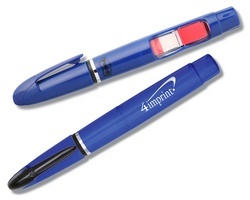 To view all promotional products available exclusively from 4imprint, visit http://www.4imprint.com/exclusives. Based in Oshkosh, Wisconsin, 4imprint provides businesses and organizations with innovative promotional merchandise, including imprinted promotional products, ad specialties, and customized corporate gifts. 4imprint is part of 4imprint Group, Plc.